I save thousands each and every year… sometimes I save thousands in a month using these 15 tips and strategies when I go garage/yard sale-ing. The year of our entire home remodel and the year of preparing and saving on our first baby, I easily saved over ten thousand dollars each year! Although it may seem very easy and straightforward, there are a lot of tips and some strategy that goes into successful garage sale-ing. It’s not a random ‘luck-of-the-draw’ scavenger hunt like many people think. You also don’t need to spend the whole day Saturday (or even more than a couple hours a few Saturdays a month) to get the huge savings! 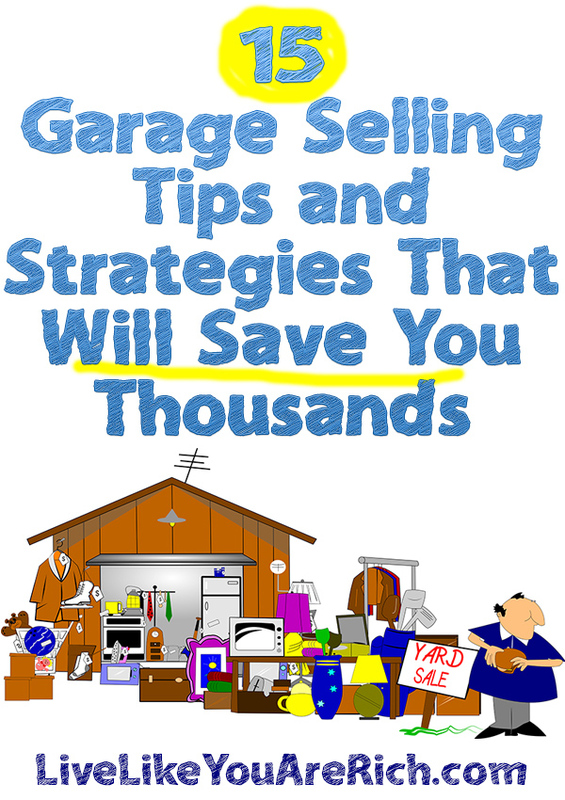 If you are strategic in the way you go about garage sale-ing you can save thousands every year without too much prep work or time out driving around as well. 1- First, have an idea of what you are looking for. Keep a list… even a mental list of items that you need. For example, today I needed 3T and 4T boy clothes, anywhere from newborn to 2T baby girl clothes, home decor items for two rooms in the house, an ottoman, spray paint (if I found the right color and type), and Christmas gifts (new items in boxes that would work as gifts for my son or the many nieces and nephews, etc. to whom we will be giving gifts). 2- Next, look up the classified section online where your community posts the garage sales they are having and search for the items on your list. This may be a popular news website like KSL.com for Utah, Idaho, and Wyoming. It may be Craigslist for most communities that do not have a prominent/popular classified site like ours. It could also be a local Facebook garage sale page for small communities. Next, type in the search bar for the items you are looking for. If you are looking for an ottoman, type it in and see what the results bring up. I use my phone and take screen shots of all of the garage sales in my area that have the types of items I’m looking for. 3- Choose to go to the most promising looking garage sales first, and either write down their address with details and the time they open, print it off, or take a screen shot on your phone to stay organized. Most sales will have a start time. I usually show up at that time…possibly a few minutes early but typically I try to arrive at the time designated on the ad of when they begin. Signs may also indicate the time the yard sale is starting as well. Personally, I like to search for and take screen shots of the best yard sales that I want to attend on my cell phone. Then I quickly make a plan based on the most promising ones, the time they open, and the location. Today I found a yard sale that was selling name-brand baby and kids clothing for both boys and girls. It opened at 8:30 AM. I started making my way there because this was the most promising yard sale on my list. On my way I saw a sign for a yard sale nearby that opened at 8 AM. I stopped, and I am glad that I did. I found 4 Christmas gifts (really nice, still in boxes, that many people on my list or my son would love). I found oil that my car drinks like crazy (it has a slow leak) for .50 a quart. I also got a new yoga mat for $2, some good DVDs, and a brand new puppy dog stuffed animal (very high quality) for a dollar. I paid $40 for about $250 worth of items, and I have 4 Christmas gifts taken care of! Then I went to the next yard sale–the one I was on my way to–and arrived right on time. I was able to get 80 pieces of HIGH QUALITY gently used name brand clothing for my son and soon-to-be daughter. My haul included 4 nice jackets/coats, lots of baby girl tights, two pairs of shoes, and 4 baby/toddler swimming suits all different sizes, plus the 80 pieces of clothing, a diaper genie, diaper changing pad, kids books, toys, a puzzle, and a few other small items–all for $90.00. I saved over $600.00!! I calculated how much I saved by counting up the clothes (80) from Baby Gap, Gymboree, Carters, etc. and averaged them out that they would have cost $7.00 each used at a consignment store which they very well could have. Then I added $130.00 more for the diaper genie, changing pad, shoes, coats, toys, books etc., which is a low number and subtracted the $90 I paid. The result was a savings of over $600!!! Not to mention I paid no tax. Next, I went to the next garage sale on my list that I thought would be promising… it wasn’t for what I was looking for. There wasn’t anything there that I went for. The items they listed either sold fast or they over advertised. But I did score a few new pieces of clothing. Savings were around $35.00. I looked at a few other yard sales but ultimately they didn’t have anything that I needed, so I went home. In two hours of driving to local homes and about 20 minutes of preparation I saved $885.00!! The Saturday before I was looking for a corner hutch for my front room and a La-Z-Boy recliner for our living room. Doing a search, I found that a garage sale nearby was selling a brand name (Broyhill) corner hutch and one near to it that opened 30 minutes later had a like new La-Z-Boy recliner. I went to the hutch one first, bought it for $50 (savings over $200) and then went to the La-Z-Boy recliner next. I found that it was perfect… the perfect size, color, options, etc. I talked them down to $70.00 from $75.00 (savings over $600.00). I went to a few other garage sales and found a few little things that saved me but then I hit my two hour mark and went home. I saved over $850.00 last Saturday!! It pays to do your research on which yard sales have what you want before you go out. So MOST IMPORTANT is to research what you are looking for and go to those sales early (right about when they open). 4- Expect great deals and walk away from bad ones! On brand new items still in package or obviously very new, my rule of thumb is to pay around 20-25% retail value or less. On used items 10% retail value or less. On really high quality brand name items like the Broyhill hutch I allow for the percentage to go up a bit but I rarely pay over 30% for any garage sale finds… this is my rule of thumb. I live in a suburban area with lots of garage sales. This percentage may vary due to size of city and location. If the garage sale prices are super expensive 40-50% or higher just get into your car and drive away. 5- Learn to tactfully haggle- Don’t be afraid to talk someone down a bit. Just please don’t be that person who just haggles just because they love to haggle. If they give you a great deal then take it! If they are wanting 40% of the retail price ask them to lower it, if they don’t, walk away. Another sly tip I incorporate is to ask, “What is the lowest you will go on this?” They usually budge the price a bit and then I say okay. Also, don’t act too excited or you give up your positioning as a buyer. Just nonchalantly ask how much an item is instead of running up to it picking it up exclaiming how it is the ‘perfect’ item for your house and how much you love it…and then asking the price. You will typically get a lower price by acting rather neutral about the item vs. super duper excited. Finally, if you are buying multiple items from the person it never hurts to count it all up with them (being honest not to miscount) and then round down a dollar or two to the nearest $5 or $10 increment. For example if the total is $38.00 I’ll ask them if they will go $35.00. 8 times out of 10 they say yes. These few dollars do add up over time. 6- Garage sale in the more affluent neighborhoods- I find that rich/wealthy people have the best garage sales. They have bought high quality, expensive stuff and their motivation to get rid of it is typically to de-clutter rather than to make a profit. This is not always the case, but after years and years of garage sale-ing I have found that it is very common… so common I usually add this into my strategy. I start in the nicer neighborhoods first, I look for garage sale ads in the nicer neighborhoods as well. If two ads say they have an item I’m looking for I’ll always go to the one in the nicer neighborhood first. 7- Take cash in smaller bills- It’s important to have cash. Do not go garage sale-ing without cash. If you have smaller bills you can haggle a little more effectively as well. For example, if you have $1’s, $5’s, $10’s, and $20’s you can pull out what you have in the bill form and round down a little more. Say they say an item is $6.00 you can pull out a $5 and say will you take $5? It is much harder to do this if you pull out a $20 and say will you take $5? I also recommend taking a little more cash than you planned on (without going over the budget) just in case you find something really awesome that you didn’t think you’d find… this has happened to me a lot. 8- Don’t always get out of your car. Do not feel like you have to get out of your car at each garage sell you drive by. I usually try to pull up in front of it and take a minute or two to really scan the sale. If there is obviously nothing on my list that I need I drive on. If it is all nick knacks or certain collectibles that I’m not interested in I drive on. IF they have a ton of stuff I’ll get out of the car and take a quick walk around scanning everything all the while looking at any visibly marked prices to see how they rank on the scale of cheapness, etc. and then if they are too expensive or nothing I need is there I just hop back into my car and drive away. 9- Keep your eyes out for yard sale signs and if you have time drive by the ones that you didn’t put on your list. Some amazing finds I’ve found were at garage sales that weren’t on my list. So drive by them and if they look reasonable and you have time stop by for a few minutes…you never know what you’ll find. 10- Pay attention to the dates on the signs and ads. Sometimes you will search for something and the only search result you get was from a garage sale that had happened on the previous Saturday. I have done this once or twice. I drove to a house and there was no sale going on. It was the previous Saturday…Doh! So just be aware of dates and times on ads and on the yard sale signs that you may pass (some people don’t take their signs down). Also, along the same lines, be aware that many people put yard sale signs out in the neighborhoods the night before (Friday night) but may not open until later 9:00 or 10:00 AM, so pay attention to the date and time on the signs and ads to avoid wasting time. 11-Inspect each item well- Be careful that whatever you buy works, doesn’t leak, isn’t broken, etc. If it has a function, make sure it is serving that function before you buy it. I steer clear of electrical stuff that isn’t plugged in, faucets that are not hooked up, appliances that are not shown as working etc. On smaller items that aren’t expensive it may be worth the risk… but I speak from experience… sadly. I have *gulp* bought an oven that didn’t run right, a fridge that didn’t work, and a boating water tube that leaked. Although these were not too expensive I did waste a lot of time and resources buying them. Since then I haven’t made this mistake again! 12- This isn’t always possible, but if you can leave the kids at home you will be able to garage sale more efficiently. I pack juice, water, snacks, toys, etc. to keep my son preoccupied. It’s also good to pack a water or snack for yourself as well. Strollers come in handy if you have a kid who will run away. But if you can leave the kids home, you can be more efficient and save more time than if they go with. 13- Don’t go garage sale-ing if you don’t need anything. This goes without saying, but if you go shopping when you don’t need or want anything you typically come home with items that sit around without a purpose aka clutter. Look around your house and home, if you think ahead a few months and there is nothing you or your family will need that you can foresee, going garage sale-ing may be inefficient and a waste of money. I plan ahead so I’m usually thinking about the next season of clothes my kids need, the types of shoes they are almost grown out of, the home improvements that will need to be made fairly soon, holiday decorations that I don’t have, etc. But there are months during garage sale-ing season (spring, summer, and early fall) that I don’t go out at all because I don’t want to spend money on things that we don’t need. The exception to this tip is when you garage sale and turn around and make a profit off of your purchases. I highlighted a SAHM who makes quite a bit on the side by buying cheap and reselling for more. 14- Have room in your car for what you are looking for. If you really need a side table and you go out looking for one, take a vehicle and perhaps a strap or two to be able to haul it. For the most part I drive the vehicle that will fit the items on my list. If you don’t have a huge vehicle and find something you love, people will sometimes take a deposit until you can get a vehicle to come and pick an item up. Of course do this at your discretion, but so far everyone I have done this with (maybe 4 times) has been honest. 15- If you have a smartphone, take it with you. Smartphones are so amazing for looking up information, looking at the classifieds for recent yard sale posts, doing a search for an item that you couldn’t find at your first few stops to see if there are a few more you can make that morning, and perhaps most importantly… they are insanely great for checking the prices of items that you have no idea what they cost new. One time I was about to buy a TV stand wall mount because the box on it said $140. I was considering buying it at $90 because it was brand new. I looked it up and on Amazon the same one was selling on sale for $65! So if you are about to shell out some real dough for something, looking it up first is a good idea. Also, looking up items for reviews is also not a bad idea if its a big purchase. I never go garage sale-ing without my smartphone. If you haven’t started garage sale-ing yet, or if you are an avid garage saler looking to be more time efficient and save more, use these tips and you will save thousands! For other ‘rich living’ and money-saving tips please subscribe, like me on Facebook, and follow me on Pinterest. Pinning this for later! These tips are the bomb! Oh my word… seriously I’m amazed by you right now- the deals you find! Come go garage sale shopping with me and help me!!!!! Pretty Please! These are some great tips! My sister is moving soon, and she’s currently considering to organize a garage sale. It will be her first one and that’s why I’m definitely recommending your post. I’m sure she’ll find it quite helpful. Thanks for all the great info! Thank you. This post is actually on how to go garage Sale-ing but here is one that could possibly be more of use to her about how to put on a successful garage sale.